Pollution in China is one aspect of the broader topic of environmental issues in China. Various forms of pollutionhave increased as China has industrialised, which has caused widespread environmental and health problems. One of the most common pollution in China is AIR POLLUTION. The celebration included 12,000 troops in 50 different military formations along with hundreds of fighter jets. Veterans and soldiers ranging from 20 to 102 years old participated. Parade training was apparently so intense that multiple officers reported losing 10 pounds or more. Photo by Kevin Frayer/Getty Images. Blue sky at night? Parade Day delight! A parade this size takes months, sometimes even years, of preparation. And in the case of Beijing’s Victory Day parade, numerous restrictions were put in place leading up to the festivities. Hundreds of factories were shuttered, and half of the 5 million registered cars in the city were banned from driving in the main urban hub. Say what you will about spending government resources on a giant party, but in this case, it definitely paid off. Photo by Jason Lee/Getty Images. 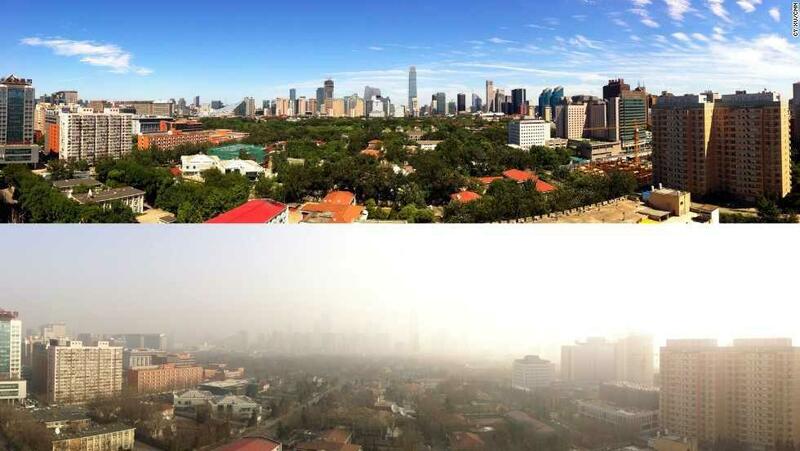 By the day of the parade, the air quality in the city of Beijing had dramatically improved. An average day in Beijing clocks in on the Air Pollution Index at around 160 (out of 500), which means adverse health effects for absolutely everyone (by comparison, an average day in the worst U.S. cities is said to be around 125). But by parade day, it had dropped to 17. Photo by Greg Baker/AFP/Getty Images. Grey sky at morning? Air pollution warning. The day after the Victory Parade, cars were allowed to return to the roads — and the Air Pollution Index in parts of the city immediately returned to an unhealthy 160 out of 500. And here’s Beijing less than one week later. Just in case you thought they were having a hazy day or something. The sky is back to looking bleak, but the future doesn’t have to be. What happened before the Victory Day parade shows that a sunny change is still possible. Air pollution is bad. Carbon emissions are bad. Cars are bad. We’ve all heard it before. But what we may not have realized is how much power we have to change things. What happened in Beijing shows us — yes, how grim the situation is, but also just how easily we can change it. By cutting back on cars and other emissions for a mere two weeks, Beijing underwent a beautiful and healthy transformation. And yet, all it took was one day of business-as-usual to bring Beijing crashing back into the danger zone. It’s something to consider the next time you get behind the wheel. We can ensure a future of blue skies if more of us walked to work, rode our bikes, or crammed onto public transportation — even just a few times a week. Those blue skies sure look nice to me.